Dr. Pearse Lyons – Thank You! 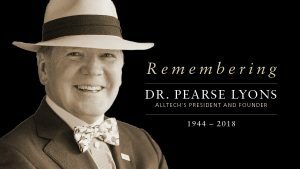 I wanted to first express my condolences to the family and friends of Dr. Pearse Lyons. I only had the opportunity to meet Dr. Lyons twice, once at the 2010 World Equestrian games and about a year ago on a business trip to his distillery in downtown Lexington. On hearing of his passing today, my first reaction was of surprise, on those times I met him I found him to be a very vibrant individual with a great passion for life. It goes without saying that I had great admiration for the man and certainly hold to this day that he was individually responsible for the fact that the 2010 Games even happened because I don’t believe they would have went forward had he not stepped in and provided the financial, political and financial support for them in the way he did. He had the guts to put both the financial well being of Alltech and his personal reputation on the line to support the Games the way he did, but then nothing I know of the man ever suggested that he knew how to do anything other then with a total commitment, for Dr. Lyons I think he was of the Yoda mind set, there was no try, only do or don’t do. Dr. Lyons, I say thank you for all you have done for Kentucky and for all that Alltech will continue to do for Kentucky, because you maybe gone but your legacy will live on. So I bid you a sad farewell but hope we get to meet again someday.